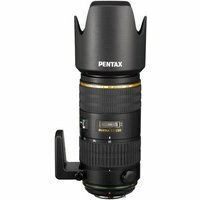 The Pentax DA* 60-250 f4 ED (IF) SDM Lens is designed to deliver fantastic optical quality with the inclusion of both super low dispersion and extra low dispersion optical elements, ensuring crisp and clear images with minimal abberation throughout the full range. Special seals mean the lens is dust and moisture resistant while the SP coating on the lens repels dust water and grease, to keep your images free from grime. With its wide range, equivalent to 92-383mm in 35mm terms, the Pentax DA* 60-250 f4 ED (IF) SDM is an ideal lens to capture everything from a head and shoulders portrait to sporting and wildlife action. The constant f4 aperture ensures faster shutter speeds at the top end while the SDM autofocus system ensures fast, smooth and quiet operation.